They have got an absolutely cute, girly website with a large variety of products for us to choose from. The products are really affordable and they also retail in various stores across Mumbai & Delhi. How i wish they start soon in the south too because certain products like Foundation needs shade selection and it is better to pick it up from a store. 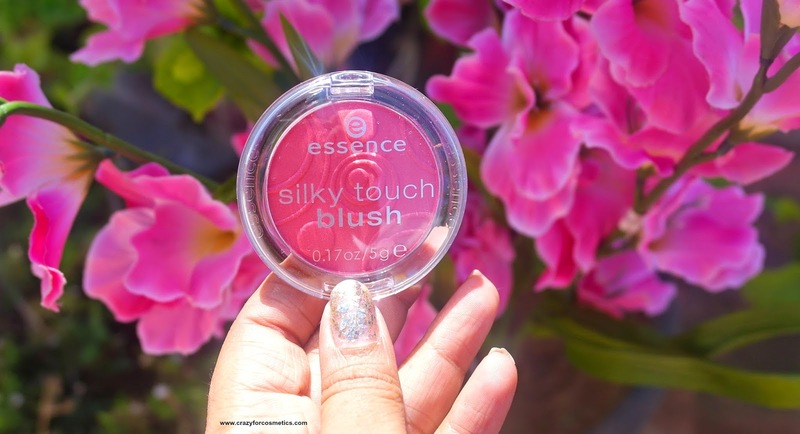 The Essence Blush comes in a sturdy plastic circular pan type container with a transparent lid that shows the shade to us. It is so light weight to carry around and compact to store it anywhere. 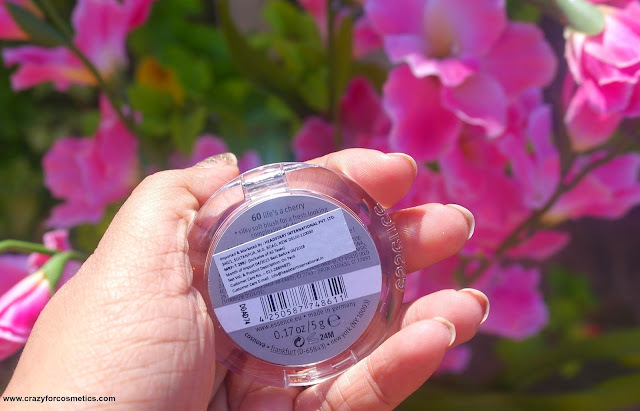 The lid closes with a click sound and we do not have to worry about messing up of the blush at any time. It has the text Essence Silky Touch Blush printed on top of the lid and the shade name printed at the bottom. The blush has small patterns been carved on them which is really cute. 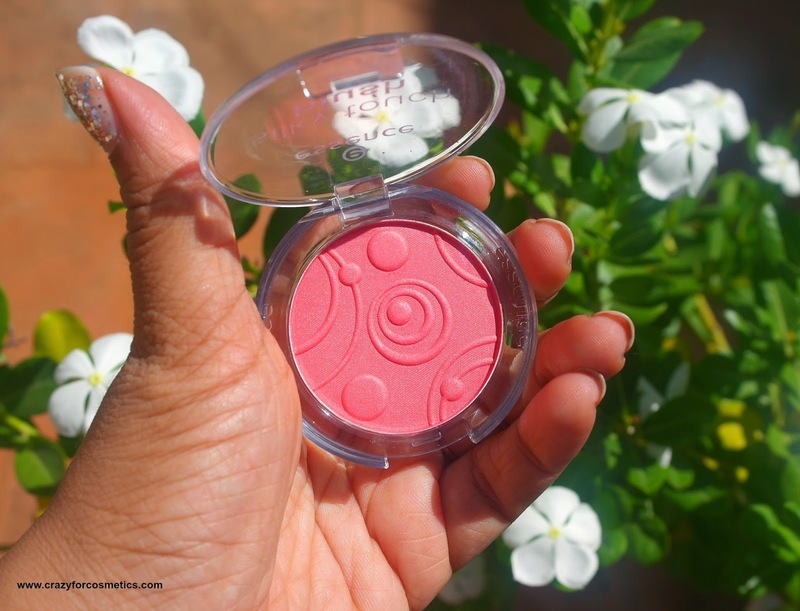 The name might mislead you and you might end up thinking that Life's a Cherry is a pinkish or plum shade, but it is a pretty, bright, coral pink shade that would suit Indian skin tone really well. The shade has minute shimmers that adds a glow to the skin (which is visible only under sunlight) and transfers as the same shade on the skin. 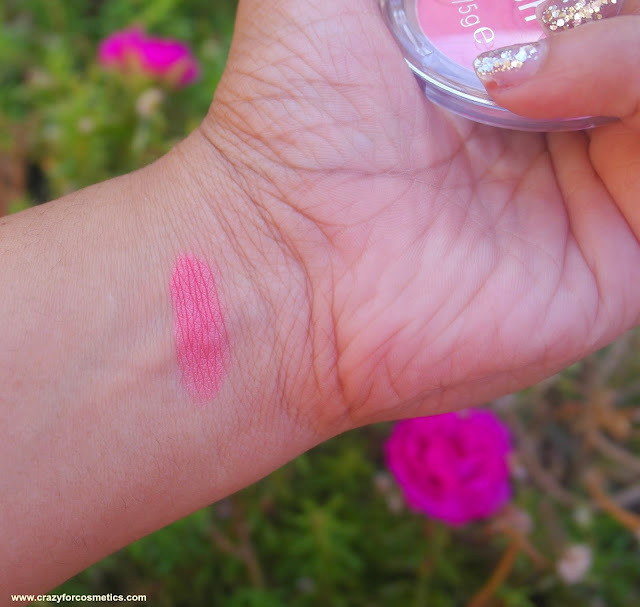 It provides a healthy pinkish glow to the skin. As the name suggests,the texture of the blush is silky smooth and it feels so soft against the skin. Hence blending becomes a cakewalk and one does not need any kind of harsh action against the skin. 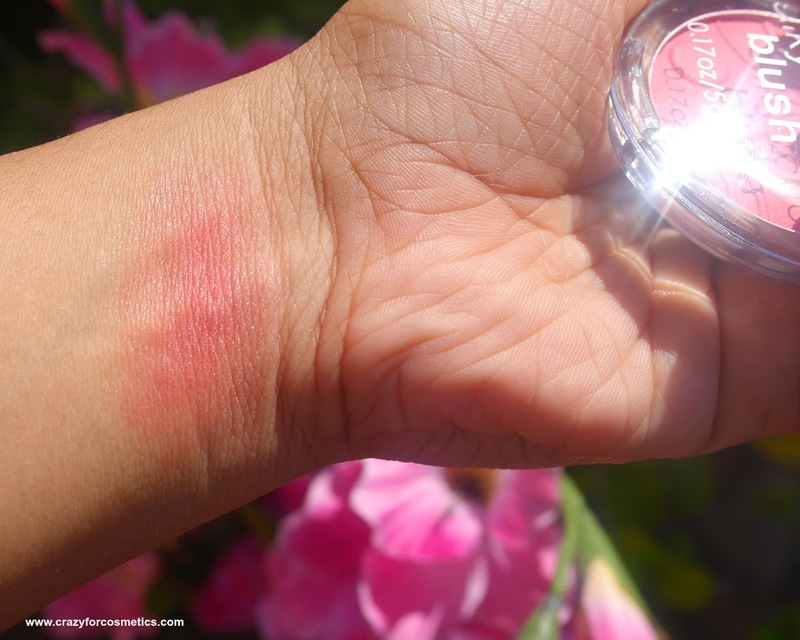 In fact, on some days when I have not washed my blush brush or not able to find it, I prefer just dipping my finger into the blush and blending it onto my cheeks with my fingers. Coming to the pigmentation, it is very well pigmented and just a dip of the tip of the brush is enough for one side. In case you are using your fingers( which is not advisable due to hygiene issues), just one swipe would do for both sides for a casual use. In case you are heading to a party or a wedding, then you might need to layer the product, but be careful to tap out the excess product from the brush since it is highly pigmented. 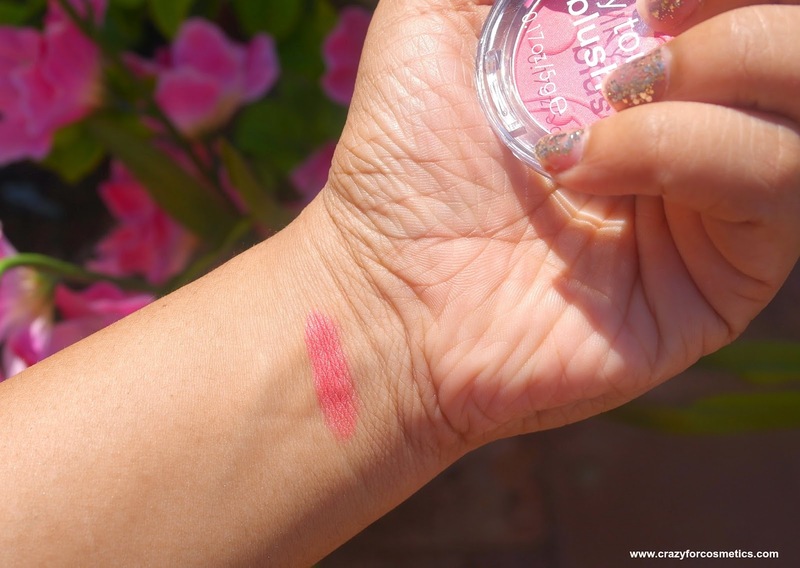 The staying power is quite decent and it lasted up to 4 hours for me and I loved how it gave a natural pinkish glow on me after about 3 hours, when it started slowly fading. Note : I used only one swipe for one side since I wanted a sheer wash of color and maybe it will last longer if you layer 2 or more. The main con is that it does not stand excessive sweating and it tends to get washed off with the sweat. 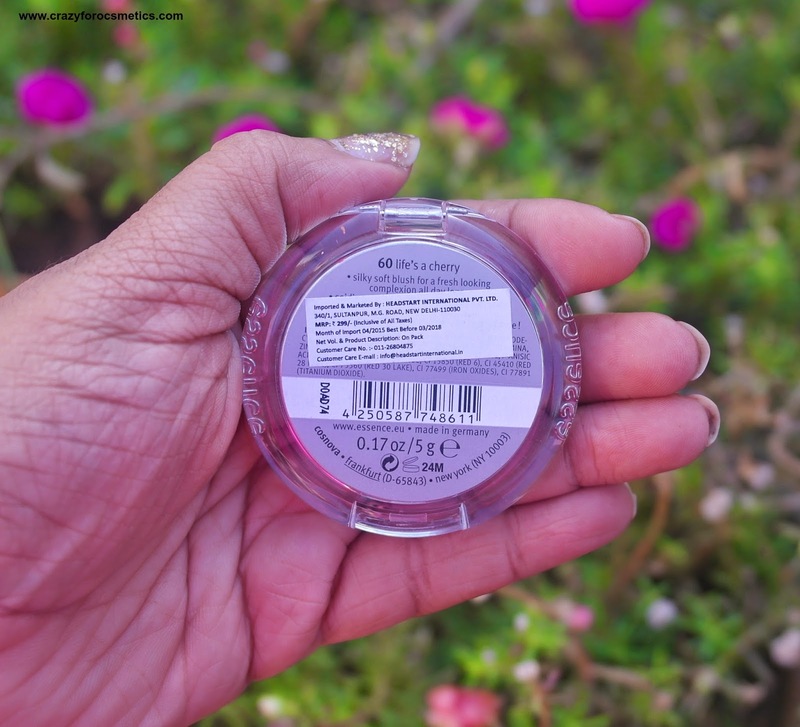 But that can happen with any powder based product and my tip to increase the wear time is to apply a cream based blush as a base and then top it up with the Essence Blush. The other product that can work as a great base is The Body Shop Lip & Cheek Tint. How to buy them if you reside anywhere in India except Mumbai or Delhi ? You can buy from Amazon.in with delivery charges extra. I just hope Essence you start retailing across all cities pan India. 1 : Pretty universally flattering shade. 1 : Not sweat resistant. It can be neglected since the blush is so affordable. 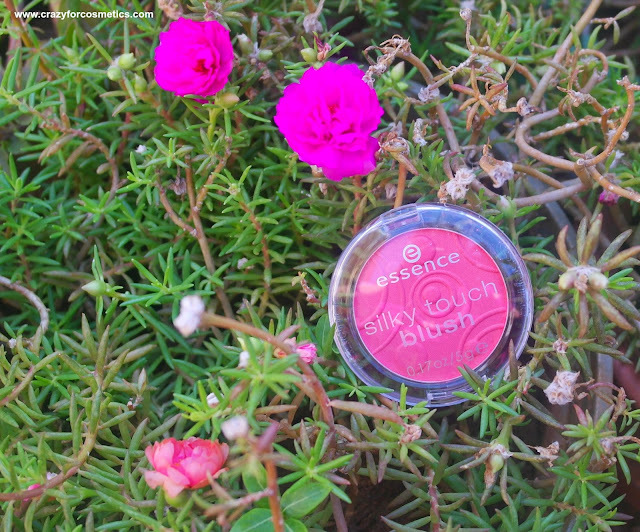 Recommendations : I think it is one of the most affordable blush available and it is such a pretty coral shade. I recommend this to all my readers.